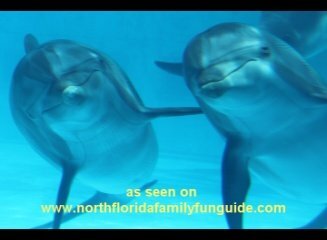 Located right on the Gulf of Mexico in beautiful Fort Walton Beach, this is an educational and delightful place to take your whole family to see your favorite marine animals. Gulfarium is an amazing Marine Show Aquarium that is the oldest continually running Marine Aquarium in the United States. The Sea Lion show was whimsical and athletic, and the trainers were really having fun with them! We loved the multi-species show to see the sea lions and the dolphins interact and perform tricks with each other. There is a new Stingray feeding pool which was very cool, and also a touch pool that had some very interesting animals to see up close and personal. Bryan touched a hermit crab, a sea anemone, and a horseshoe crab with delight! The shark exhibit was very interesting, and had two species of sharks found in the local waters, the Lemon Shark, and the Nurse Shark. They have feeding demonstrations throughout the day. We saw, penguins, parrots, turtles and more at this fantastic marine attraction. Live Rock, Hard Corals, Soft Corals, LPS Corals, Fantasy Rocks, Coral Frags, Coral Packs, Phytoplankton, Macroalgae, Live Sand, Invertebrates, and Fish! They have several programs for kids that look fun and inviting. They have an Arts on the Beach after school program on Tuesdays, with art, music, and dance classes for kids. They also have a Summer Camp program! Another interesting camp program is the Mommy and Me, and Daddy and me programs! They are geared towards children ages 3yrs to 5 yrs! How fun! The classes are 2 1/2 hours a day Monday through Friday, with themes like,“Beach Party”,“Animals in Motion", “Gulfarium Life”, and “The Rhythms of Nature” . These daily themes include animal shows, scavenger hunts, beach games,hands-on encounters, behind the scenes tours, and plenty of water activities! This looks awesome! We had a great time at Gulfarium, and even enjoyed the amazing, giant gift shop full of treasures. We bought a shark tooth necklace, and a globe toy that Bryan carefully selected amongst thousands of items!